Visit us at Safety and Health Expo! See you at the Safety & Health Expo! 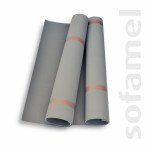 Insulating matting are also known as dielectric carpets, and are used to protect people and parts of electrical equipment used in switchboards, transformers and other high voltage workplaces.